Skipper and Gilligan are sitting on the beach, here on Gilligan's Isle! Skipper: Hey, Little Buddy? Little Buddy? Skipper: Tell me, Little Buddy: Ginger or Mary Ann? Gilligan: Gee, I dunno, Skipper. How about you: Ginger or Mary Ann? Skipper: I'm not sure either, Little Buddy. But I have a feeling people are going to be asking that question for years to come. The Professor walks onto the beach. Skipper: Which is it for you: Ginger or Mary Ann? Professor: Haven't decided, Skipper. But I have a feeling people are going to be asking that question for years to come. Ginger walks onto the beach. Ginger: Would you please come with me and help me pick some coconuts off a tree? Ginger: Oh, Skipper, take a gander at these! Skipper: Ginger, such big beautiful coconuts! Ginger: Grab 'em, Skipper! Hold them close. Skipper: I've got them, Ginger! Oh, they feel wonderful! Gilligan and the Professor look at each other incredulously. Ginger and Skipper return to the beach. They notice the Skipper is holding two large coconuts in his hands. Mary Ann walks onto the beach. Mary Ann: Professor, could you help me dig out the inside of my canoe for a few minutes? Professor: Sure. In fact, I've got a tool here that might help us with that. Mary Ann: I want it deep, Professor. Use your big tool! Professor: I can drive it as deep as you want, Mary Ann! Mary Ann: Oh yeah! Deeper! Deeper! You're a master with that tool, Professor! Professor: You know, they all say that! The Skipper and Gilligan look at each other incredulously. The Professor and Mary Ann return to the beach. They notice the Professor is holding a metal tool and dragging the canoe. Mrs. Howell walks onto to the beach. Mrs. Howell: Oh Gilligan! I understand you're quite the expert at catching fish in your bare hands. Skipper: It's true, Mrs. Howell. Fish make out their wills when they see Gilligan coming! Mrs. Howell: Well, perhaps you can teach me how, Gilligan. Mrs. Howell: Gilligan, it's a big one! Gilligan: Wrap your hands around it, Mrs. Howell, it's very slippery! Mrs. Howell: Oh, my hands are sliding up and down, up and down, up and down! Gilligan: And later I'll help you eat it! Gilligan and Mrs. Howell walk back onto the beach. Skipper: So, you two, where's the fish? Just then the Professor jumps up. Professor: Look, a ship! Finally we're saved. Skipper: Can you see the name of the ship? Professor: It looks like the SS Lavender! Gilligan: That's a funny name. Ginger: Here they come! Gee, they're dressed better than I am! Armando: Hello-o-o! Oh, dear me, looks like you all need an emotional rescue. Captain Joseph: I'm Captain Joseph and this is my First Mate Armando. 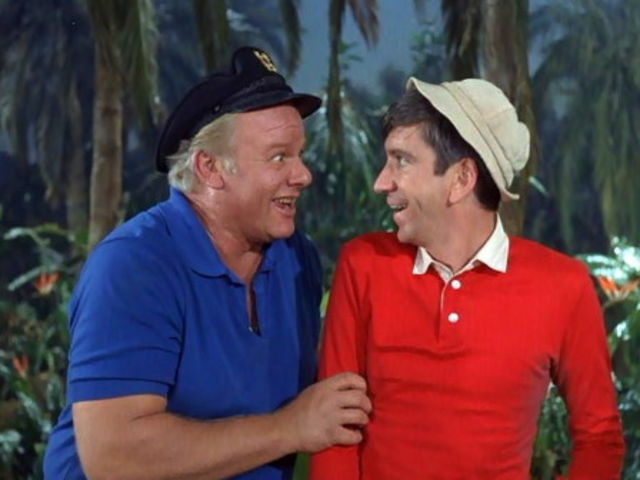 Skipper: I'm the Skipper and this is Gilligan. And this is Ginger, Mary Ann, the Professor, and Mrs. Howell. Captain Joseph: Well, collect your accoutrements and we'll shove up ... I mean, shove off. The castaways go off to collect their things. Armando: Captain, I just have to ask you. Armando: The Skipper or Gilligan? Captain Joseph: I don't know. But I have a feeling people are going to be asking that question for years to come. So, that's what it's like on cruise ships. If they don't put out, do they get abandoned again on the Island? Dawn Wells aka Maryanne was born and raised in Reno Nevada. She was Miss Nevada in 1960. You're welcome. 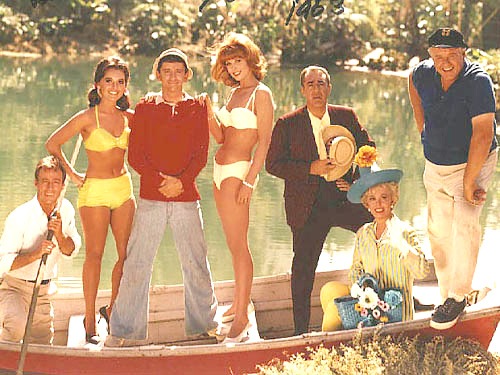 There's only four things to consider here: Ginger or Mary Ann or the Skipper or Gilligan. Vote now! Yep. And I am a Mary Ann, so thanks for that! Why are there never any supermodels arguing over Russell or Perry (although the obvious choice would be Russell)? 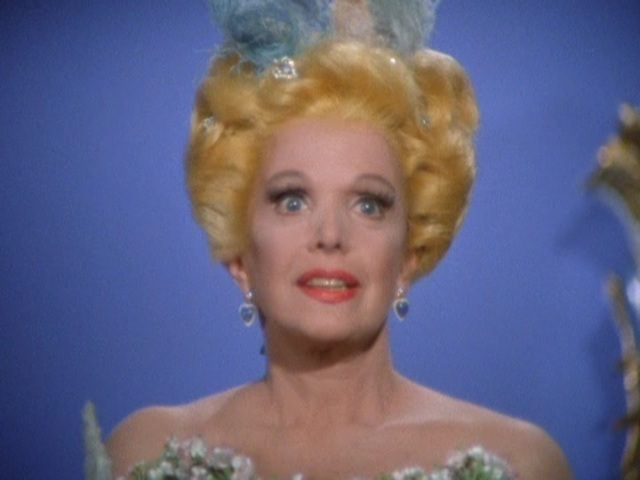 Personally, Mary Ann would have been my first pick. I heard you had a crush on Mrs. Howell. Well, as you can tell from our story she's the only one who's any fun. Yes, I would pick Mary Ann too. She's aged much better also; take a look at the pictures. And now let me ask you the big question, Russell: which is it, the Skipper or Gilligan? the one with smaller hands. Well,that would be me ... oh,wait, you said hands!